A massive national park which has only partially been explored. 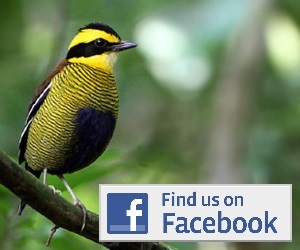 Known sites include Tambun for Maleo and some nice lowland birding. Bogani Nani Wartabone National Park (formerly known as Dumoga Bone National Park) is a huge area of forest spanning the border between North Sulawesi and Gorontalo provinces. Despite its size, the access is very poor to the central areas and most visiting birders just visit the margins on the park around the villages of Dolodua and Toraut. Here there are 2-3 sites where reasonable forest can be accessed quite easily, and it is also here that the famous Maleo nesting ground of Tambun lies. The most commonly visited forest areas of Bogani are in the vicinity of the villages of Dolodua and Toraut. From the village of Dolodua there are paths heading south that follow the river and which pass through some patches of nice forest. 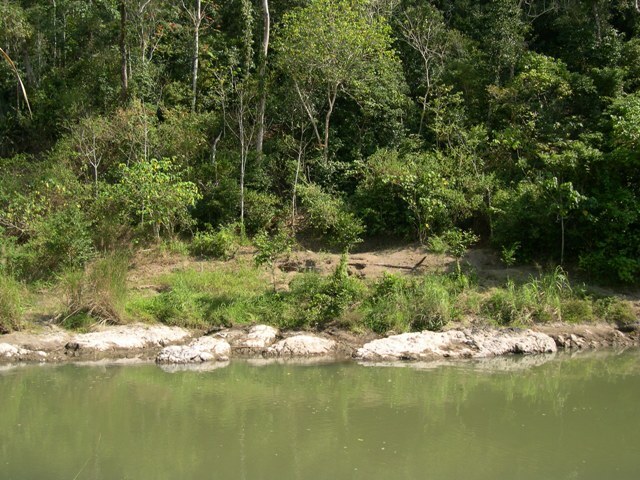 The forest is much more extensive on the western side of the river, as this lies within the national park proper. On the eastern side of the river forest patches are interspersed with open farmland. By following the river about 6-7 km south of Dolodua the trail reaches the still-active Maleo nesting ground at Matayangan. This is nesting ground is highly threatened by egg collecting, but still provides an opportunity to see Maleo if you are lucky (see section below on Maleo). By following the road onwards from Dolodua it bends north and heads to the village of Toraut (or Taraut). A little bit further on from here the road reaches the edge of the forest and by crossing the river some nice condition forest can easily be accessed, Many small trails head into the forest heading north, and then begin to rise in altitude the further they are followed. 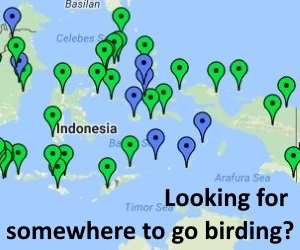 Birds in this area include many of the same lowland species present at Tangkoko, with perhaps a slightly better chance of seeing some species like Sulawesi Hornbill, Yellowish-breasted Racquet-tail, Purple-winged Roller, Bay Coucal and the owls. Maleo lay their eggs communally in pits dug in the ground in soil heated by either volcanic hot-springs or on beaches heated by the sun. Once laid the parents take no further part in the incubation of the eggs and after around 60 days the chicks hatch and dig their own way to the surface, to emerge fully-feathered and independent. While being ecologically fascinating, this strategy makes the eggs extremely vulnerable to collecting, and despite the legally-protected status of Maleo in Indonesia such egg collecting continues. To combat this threat a number of Maleo nesting grounds are now guarded full-time, and the eggs are removed from where they are laid and relocated to natural hatcheries where they continue to be incubated by the volcanically heated soil, but where they are safe from the attention of egg collectors. The best sites for viewing maleo in the Bogani area are all protected by the Wildlife Conservation Society – Indonesia Program, which pays for the full-time employment of a site warden and facilities at each. This includes Tambun, Muara Pusian, Hugayono (in the west of the park) and the beach nesting sites at Binerean and Lagamuru. For more information on the WCS Maleo Protection Project, visit the web-site of the WCS Indonesia Program here. Tambun is the most commonly visited site, and one of the most convenient. On average around 2-3 pairs of Maleo visit Tambun a day, given a pretty reliable shot at seeing the birds. Adults descend from the hills to lay eggs at dawn and dusk, but can also often be seen loitering around the site in trees during the day. To see birds here report first to the warden on-site and he will show you to the best locations to see the birds. Several hides have been set up and if you are lucky you will get amazing views. It may also be possible to see newly hatched chicks being released from the safety of the hatcheries. Another alternative site not far from Tambun is known as Muara Pusian. This site also has a warden, a watchtower and hides. The main nesting ground is on the opposite side of a river from the hides, which provides for unobstructed views if birds are present. Both Tambun and Muara Pusian are backed by forest and trails branch out into it. So once you have seen Maleo you can easilt spend a few hours birding around here, seeing many of the same species as listed above for Dolodua/Toraut. To get to Muara Pusian the easiest bet is to ask for directions at Tambun. For something a bit different, you could also try visiting the beach nesting sites at Binerean and Lagamuru. These sites lie on the south coast, about 1-2 hrs drive from Dolodua. The nesting sites are most easily accessed by small boat from the village of Mataindo. Ask any local there for help and they will direct you to a boat, and then the site. At the site report to the site warden and he will be able to show you how to view the birds. A hide and watchtower have been set up and if birds perform the views are spectacular. To get to the areas of Bogani described above the best bet is to travel first to Kotamobagu. This is where the National Park office is now located (at Jalan AKD Mongkonai, Kotamobagu, 95716) and ideally you would report here to obtain permission to enter the park. All of the sites listed above (including Tambun), with the exception of Mataindo/Binerean/Lagamuru, lie within the National Park. From Kotamobagu drive or take a bus to Dolodua (sometimes spelled Dulodou). The park headquarters is no longer here, as mentioned in older guides, but there is currently a small guesthouse that can put you up and help with local transport arrangements (Tante Mien’s homestay: Tel. +62(0)81523833505). They may also be able to advise you on the need to report to the park etc. and equip you with a local guide if you want one. From Dolodua to Toraut take local transport (minibus or motorbike taxi). To visit Tambun you can either stop by on your way to Dolodua, or make your way back there from Dolodua by local transport. If you ask the site warden at Tambun nicely he may also, for a small fee, allow you to stay at the station there, and even feed you. To visit the beach nesting sites at Binerean drive south from Dolodua, then east along the coast to the village of Mataindo. This is also probably possible by bus/minibus; ask in Dolodua for the options. Once in Mataindo ask about the Maleo nesting site (for example just say ‘Maleo’ a lot!) and someone will direct you to a small out-rigger canoe and then take you the 1-2 km along the coast to the site. As with Tambun there is a small station there where asking nicely might get you permission to stay. You would ideally bring some of your own food with you if you want to stay overnight (noodles etc), and the guys there will probably cook it for you.